In March, 2014 Fluoride Free Lethbridge responded to a memo that Alberta Health Services sent to their frontline staff. 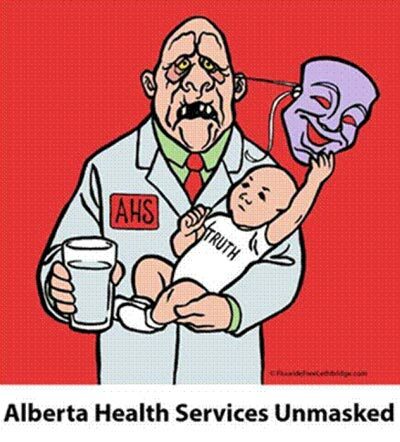 The Fallacies of Alberta Health Services Position on Artificial Water Fluoridation Exposed Click Here was written to refute, with facts and science, the outrageous arguments used by fluoride proponents everywhere. This is a rebuttal of heroic and comprehensive proportions. I congratulate all those who put it together. Please feel free to use this information when discussing fluoridation. It addresses the most foolish of arguments used by dentists, health professionals, and know-it-alls supporting artificial water fluoridation. The following is from Fluoride Action Network concerning the announcement this week that the U.S. Department of Health & Human Services (HHS) recommends lowering the water fluoride levels to 0.7 mg/L. On Monday, the U.S. Department of Health & Human Services (HHS) admitted that the fluoride levels, which they promoted and encouraged as safe, has damaged children’s teeth. Because of the huge increase in dental fluorosis (white spotted, yellow, brown and/or pitted teeth) on the teeth of 41% of young teenagers, HHS says that water fluoride levels should be lowered to 0.7 mg/L (formerly most communities used 1 mg/L while the guideline was 0.7 – 1.2 mg/L) and in ten years they’ll check children’s teeth to see if they were right about this new level. issue has not yet been responded to. The HSS response to these concerns was to whitewash them. HSS did not address the fact that infants who receive formula made with fluoridated water at the new guideline level will receive 175 times more fluoride than the breast-fed infant. HSS also stated in its press release that a report on the toxicology of fluoride by the National Research Council of the National Academies (NRC, 2006) “found no evidence substantial enough to support effects other than severe dental fluorosis at these levels.” What HSS failed to state is that the NRC report of 2006 stated for the first time that fluoride is an “endocrine disruptor”, which means it has the potential to play havoc with the biology and fate of humans. This is far more significant than severe dental fluorosis. Severe dental fluorosis is the only endpoint of concern that HSS considers as an adverse effect of fluoride exposure. While there are now 43 studies reporting a relationship between fluoride exposure and reduced IQ in children, HSS cites the meta-analysis by Choi et. al. (2012) which reviewed 27 of these studies (the NRC report looked at only 5 studies). In toxicology it is the lowest level that causes harm that is of concern when using such results to protect a whole population, not the highest level. In this case the lowest level at which IQ was lowered was 0.88 mg/L. If we take 20 studies where IQ was lowered, and the source of fluoride was in water and be compiled from all sources. In the case of the Chinese children in rural villages in these studies they did not have two sources that US children commonly have: typically they are not bottle-fed and they do not use fluoridated toothpaste. So it is likely that some American children are getting higher doses than some of the Chinese children who had their IQ lowered. This is elementary stuff and one can only assume that whoever used the figure 11.5 mg/L knew exactly what they were doing and that was to deceive the casual reader that not from coal, the mean value was 3.52 mg/L, and this is lower than the EPA’s current “safe” drinking water standard for fluoride (4 mg/L). In addition, in toxicology it is not the concentration of fluoride (mg/liter) that is the relevant parameter but the dose in mg/day (how much you drink), and such a dose has to there was nothing to worry about, when the opposite is the case. Because fluoride is an endocrine disruptor and has the potential to lower IQ in children, FAN urges HSS to adopt the Precautionary Principle and end fluoridation now. HSS noted that the Environmental Protection Agency (EPA) “uses the 90th percentile of drinking water intake for all age groups to calculate the relative contribution for each fluoride source.” This means that individuals who consume greater amounts of water than the 90th percentile are not protected by the new rule. These individuals include, infants, nursing mothers, outdoor laborers who work in hot climates, athletes, diabetics, and more. This letter was published in the Sherwood Park News, Opinion Thursday, April 30, 2015. As a neurological learning specialist (retired), I have been acutely aware for many years that the fluoridation of drinking water supplies interferes with our children’s learning capacity. Modern scientific studies have now corroborated this clinical finding. Scientifically well-documented studies presented by numerous credible scientists all over the world, as reported by Paul Connett, PhD, and our very own Alberta expert in Calgary, James Beck, MD, PhD, in The Case Against Fluoride: How Hazardous Waste Ended Up in Our Drinking Water and the Bad Science and Powerful Politics That Keep it There. Thankfully, the City of Calgary has now removed fluoride from their drinking water supplies because it has been documented to damage infants severely, and also to provide measurable damage to the brains and other organs of children and adults. the Sherwood Park-Strathcona County News, April 21, 2015, page 27 (“Use fluoride to prevent cavities”). Their article shows their reliance on old data that has been repeated for decades, to the detriment of the health of our children. They appear not to know that modern studies demonstrate that tooth cavities have declined in countries that have not fluoridated their drinking water supplies. Attributing tooth decay decline to added fluoridation is just another example of false correlation studies.